Opinion Release: The Clerk's Office typically releases opinions at 11 a.m. each Thursday. Court staff posts them to this website as soon as possible thereafter. There will be times when opinions may be released outside of this schedule, such as in emergencies. Scheduled and unscheduled opinion releases are announced via Twitter @flcourts. The Court generally convenes during the first week of each month, except during mid-summer. Typical oral arguments allow each side either 20 or 30 minutes. The Office of the Clerk is responsible for maintaining all case files and tracking the progress of cases through the Supreme Court. In the Supreme Court, use of the Florida Courts E-Filing Portal is mandatory for attorneys in good standing with The Florida Bar in compliance with Rule 2.525, Fla. R. Jud. Admin., and Administrative Order AOSC13-7 . The Court makes available many different forms of information about cases. The most common way to find information about a case is to review the case’s docket -- a list of briefs and other filings and rulings in that case. You can contact court spokespersons in other Florida courts by referring to the list maintained by their professional association, the Florida Court Public Information Officers, Inc.
Requests to the Florida Supreme Court for official public records should be made in writing pursuant to Rule of Judicial Administration 2.420 to publicinformation@flcourts.org. Rule 2.420 is the judicial counterpart to Florida's public records statutes, Chapter 119. 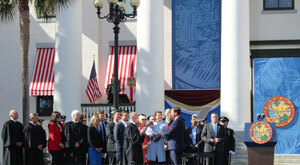 By long tradition, Florida's Chief Justices usually swear Governors into office at the public inaugural ceremony. It happened again Tuesday when Chief Justice Charles Canady gave the prescribed oath to Florida's new Governor Ron DeSantis on the east steps of the Old Capitol Building in Tallahassee. Strictly speaking, it is only a custom. Anyone legally authorized to administer an oath, including a notary public, could administer and verify the oath. In recent years, Governors have quietly filed written oaths long before the public event occurs. But auspicious public occasions beg for something more formal. Governor Claude Kirk honored the custom in the breach on January 3, 1967, when he bypassed the actual Chief Justice in favor of the next person in line for the office, who also happened to be a former Governor, Millard Caldwell. Tragedy sometimes has led to a break in the tradition. When Governor Lawton Chiles died unexpectedly near the end of his term in December 1998, the Chief Justice was unavailable to swear in the Lieutenant Governor. So the job fell once more to the next-in-line as Chief Justice, Charles T. Wells. On December 13, 1998, Wells gave the oath to Governor Buddy MacKay to serve the remaining 23 days. That was all that was left in the term until Governor Jeb Bush took over, sworn into office January 5, 1999, by Chief Justice Major B. Harding. On the other hand, some Chief Justices get double duty. Chief Justice Parker Lee McDonald swore in Governor Wayne Mixson on January 3, 1987, even though Mixson was only Governor for a total of three days. Mixson completed the term of Governor Bob Graham who had just been elected to the U.S. Senate. Chief Justice McDonald then swore in Governor Bob Martinez three days later on January 6, 1987. Some customs surrounding gubernatorial inaugurations have changed over time. In earlier years, the Clerk of the Florida Supreme Court held the Bible on which Governors placed their hands while swearing to faithfully execute the office. Former Clerk of Court Sid J. White fulfilled this role several times during his 34 years in the Clerk's Office. The Bible held by Mr. White remains in the possession of the Florida Supreme Court Library Archives. Records are not precise, but Supreme Court staff believes this ragged old Bible was used to swear in at least five Florida Governors. Visit our Facebook page for more images. Photo by: Aimee Clesi & Linnea Dulikravich, interns from the Bob Graham Center for Public Service. Subscribe to receive Florida Supreme Court opinions. A message will be sent to your email account for the regular calendar releases each Thursday morning and for out-of-calendar releases issued in expedited cases. The message will include a link to the full text of the opinions on our website.